Today on the Doc On The Run podcast we’re talking about whether or not you should run when you think you have plantar fasciitis. Can I run my race if I think I have plantar fasciitis? That’s a good question. In this session what we are going to talk about is whether or not you can or should run if you think you have plantar fasciitis. The first thing to think about is what is plantar fasciitis? Well “it is” mean inflammation so if you have plantar fasciitis, it’s just irritation and inflammation of the largest ligament in your foot. Again, the doctor’s job is to make you heal. The doctor’s job unless you make it their job is not to get you to your goal race on time. So when you go to the doctor, make sure you explain your doctor “Okay my foot hurts but the problem isn’t that my foot hurts. The problem is that I want to do this particular marathon on this particular day. I have this much time to get ready and I want to finish in this particular time.” You need to make sure that the doctor is on your team. That’s the key thing you’ve got to do differently when you go to the doctor. Don’t just answer their questions. Make sure that you get your point across. Now back to the topic at hand. If you have plantar fasciitis, some people will tell you it’s self-limiting, eventually it will just go away. Not true. 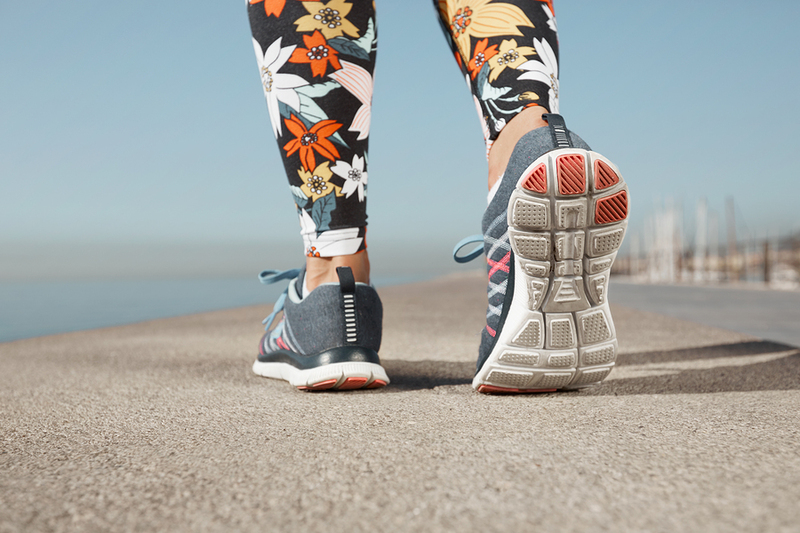 If it’s inflamed and you continue to run on it, you continue to irritate it, you continue to aggravate it and you get chronic inflammation around the plantar fasciitis, it won’t just go away. It can’t. It’s not going to heal. That doesn’t mean you can’t run. Well the problem is if you do that, you get chronic inflammation that develops around the plantar fascia. You get irritation, your body responds with the inflammation and then the inflammatory fluid actually contains degradative enzymes. They’re supposed to remove tissue debris. All that junk that happens as a consequence of the injury. Well the problem is degradative enzymes actually degrade collagen. Your plantar fascia is a huge sheet of collagen on the bottom of your foot. So if you have those enzymes continually infiltrated around the plantar fascia dissolving the plantar fascia effectively, the plantar fascia develops a different problem called plantar fasciosis. When runners just run and ignore it for a year or two, they get plantar fasciosis. The fascia gets thicker. It gets degenerate. Some of the fibers start to rupture. You get a bunch of little tiny partial ruptures where the fascia is actually coming apart. Then you have a different problem all together. It’s not plantar fasciitis anymore. It’s fasciosis which is a different problem. You don’t want to just ignore it and run. You have to do something about it. But if you do something about it and you can improve while you run, then you can stay on track and you can finish your goal of time. So again, thing that prevents a plantar fascia from healing is too much continual stress applied to the fascia and too much inflammation. Get the inflammation out. Do contrast baths, ice it, wear compression socks, elevate your feet. Do whatever it takes to get the inflammation to calm down. 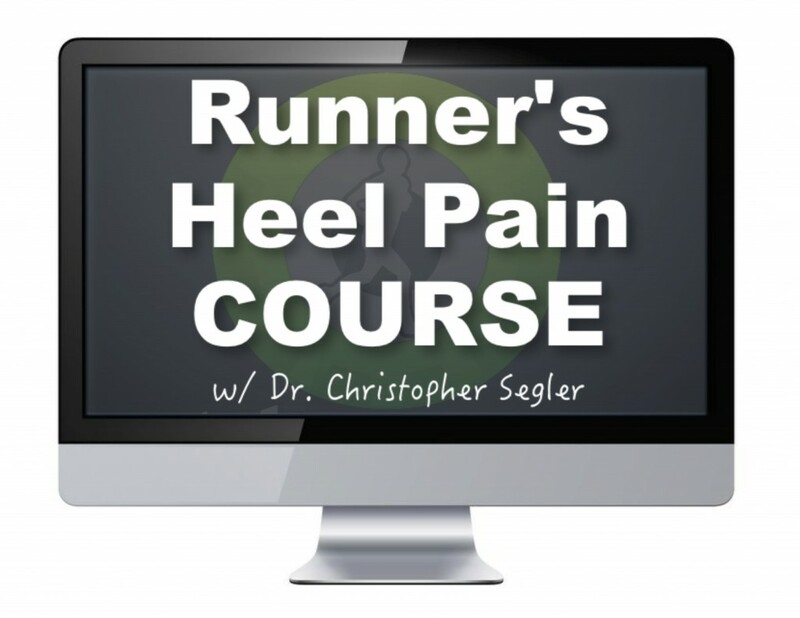 We discuss all that stuff in the Runner’s Heel Pain course. But just do whatever it takes to get the inflammation out and don’t do corticosteroid injections. Don’t let your doctor inject you. It weakens the collagen and it’s more prone to rupture if you just run on it. So don’t do that but do all the natural stuff you can do at home all by yourself to get the inflammation to calm down first. If it calm down, it feels better than what I would do is try to really support your fitness. Try to do some other stuff to maintain your running fitness and run a little bit to test it out. You want to make sure you’re running on the right side of the road. If you haven’t seen that video you should check that out on how to run on the right side of the road when you have plantar fasciitis because if you pick the right side of the road depend upon which direction you’re running, it will actually change the amount of stress and strain on the plantar fascia. Your goal is to decrease the stress to the plantar fascia. I personally, a few months ago, I had plantar fasciitis on my right foot and all I did was run on the right side of the road where I was deliberately running on the slope to supinate that foot and decrease the stress to the plantar fascia and my player fasciitis healed in two weeks. I did not do anything else. No pills, no injections, no night splints, no fancy gizmos, no stretching routine. Nothing. I ran every day on the right side of the road, my plantar fasciitis went away. So yes in that respect. That’s proof that you can run with plantar fasciitis if you know what the problem is, if you know how bad it is, if you monitor it and you’re making sure that it’s not getting worse and then it’s in fact getting better even as you continue to run. That’s the main thing, you got to think about what prevents it from healing and don’t do those things. Then think about what helps it heal and do those things. Do the stuff that really supports the plantar fascia. Pay attention to your nutrition, make sure you’re sleeping, make sure you’re not stressed out. Make sure that you’re stretching the Achilles tendon because that’s really one of the keys to healing plantar fasciitis and then also do something to reduce inflammation in terms of antioxidants in your diet, turmeric, taking collagen supplements or something like that. They can actually help rebuild any little micro tearing that might have happened in the plantar fascia. Course check with your doctor before you take any kind of nutritional supplements. But those things can all help. The whole key again is to try to do whatever you can control to accelerate the healing, make sure you reduce the inflammation and then make sure you just really monitor your pain. Monitor your swelling, make sure you’re not getting any swelling and keep a pain journal to make sure your pain is going down. It’s right there on the website. I actually made a pain journal for runners that you can just printout. It’s PDF. So you just print it out, keep track of your pain, keep track of what runs you’re doing when it happened, what surface you’re running on and then you can continue to improve even as you continue to run and heal your plantar fasciitis. But don’t just ignore it. That’s the worst thing you can do is just think “Well I’ll just tune it out.” You have to pay attention to the pain. The pain is going to be associated with inflammation. If it hurts, you’re getting more inflammation. If you’re getting more inflammation, you’re getting more of those degradative enzymes around the fascia that can damage at long-term. You don’t want to do that. So that’s the thing is you really have to just be thoughtful about this and be deliberate about doing all the things you can help it improve. Avoiding all the things that will make it worse but that doesn’t mean you have to stop running. Most runners with plantar fasciitis can run and heal their plantar fascia all at the same time. You just have to be thoughtful about it. When you see your doctor you also need to make sure your doctor’s being thoughtful about it. That sounds stupid but trust me, I used to do this. Basically any patient that came in with heel pain, they were assumed to have plantar fasciitis and that’s common in most doctor’s offices. So it’s a simple fix for plantar fasciitis but usually that’s just like first step reduce the inflammation or corticosteroid injection, you don’t want to do that, or stop running, you don’t want to do that. Wear a night splint or as fracture walking boot, you don’t really want to do that either. You have to do all the things that are going to help without making your running fitness to worse without actually decreasing your fitness making you weak or making you lose all that aerobic fitness you worked so hard to build. That’s why you have to really talk your doctor about this and point that “Look, this is my goal. The only way I’m going to give you a good review and tell people that you’re awesome is if you get me to my goal race on time. If you tell me to sit out my race, I’m not going to tell my friends that you’re an awesome doctor.” That’s just the way it is. You need to be straight with your doctor. You’ve got to be really forceful sometimes in explaining that this is your goal. Your goal is to run, your goal isn’t to get the heel pain to go away. Your goal isn’t to make the heel pain go away when you wake up and step out of bed. The goal is to get you to race and be able to run and be fit for that run. So that’s the big thing. Again, that brings up a main point here that the standard of care is what most doctors do in any given community and the standard of care fails most runners. Most writers want to run. Most doctors tell you to stop running. So when you go to the doctor, very specifically tell the doctor what your timeline is. Tell them what race you’re going to do. Tell them what your training plan is and what races or what runs you think you have to do in preparation for that race. You need to be straight with your doctor and you need to make sure that they understand what you’re real goal is. That’s crucial. The next thing you need to think about is that you got a monitor it. So there are three ways to monitor it. If you have bruising, first of all you probably don’t have plantar fasciitis eyes. It’s a partial rupture of the plantar fascia. If you have lots of swelling, you may have a partial rupture or even plantar fasciosis but there really isn’t that much swelling when you have plantar fasciitis. So you want to monitor that. You need to look for bruising. If it really hurts, you look for swelling, you need to monitor your pain. Again get the pain Journal printed out. Keep track your pain and make sure you’re staying on track. If you’re getting better that’s good. You should be able to continue to run and continue to run more. Your goal is to get your heel pain to go down and you’re activity to go up even as you continue to heal. So that’s really what you have to focus on. Then you have to really make sure you do everything else. You want to fortify the rest of your system. The whole rest of your chassis. Everything else, glutes, hamstrings, your core, everything that supports you when you run. You want to work hard to strengthen those things so that as you run you don’t lose your form and pronate unpredictably in a way that’s going to stress the plantar fascia that would put you at risk of re-injury to the plantar fascia. You really have to be thoughtful about this. Really think about what you can do, where you run, what workout you do, what are the things you can do changing running form, what can you do to put a little bit less stress on the plantar fascia and continue to heal. What are the things you can do to heal faster whether its nutritional supplements or sleeping more, decrease your stress more. 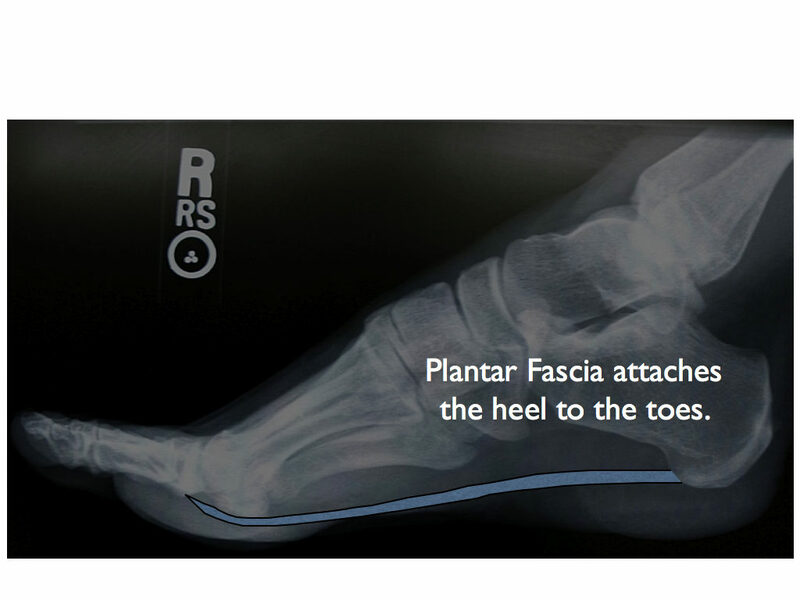 What are the things you can do to make the plantar fascia heal faster? Don’t just accept the standard of care. You don’t have to stop running. You don’t have to have corticosteroid injection. You don’t have to take Ibuprofen every day. You just need to figure out what’s right for you and that probably includes running. So talk to your doctor about it. Make sure you’re thoughtful about it. Make sure you’re keeping track of your progress and then try to keep running while you get your plantar fascia to heal.